Her daughter "did not even see the train," she wrote. Kailynn Bursic-Panchuk died at the age of 17. A Saskatchewan mom is pleading with people to stay off their phones when driving after her daughter died doing just that. "I just would like to save at least one life," Sandra LaRose told HuffPost Canada Thursday about why she wants her daughter's story shared far and wide. Kailynn Bursic-Panchuk was driving on Aug. 16 when her vehicle was hit by a train. She spent her 17th birthday on life support in hospital and died the next day. This month, her mother found out about the "unofficial" cause of death. "My SMART, sensible, beautiful young lady was looking at her goddamn f**king phone. She had it laying on the seat, following Google maps, and looked down and DID NOT EVEN SEE THE TRAIN. I have been to the accident site. Had she been paying attention she would be at work today. Not in a f**king urn," LaRose wrote in a now-viral Facebook post. "If I see someone at a light texting, talking, or looking at their phone I will knock on their window. 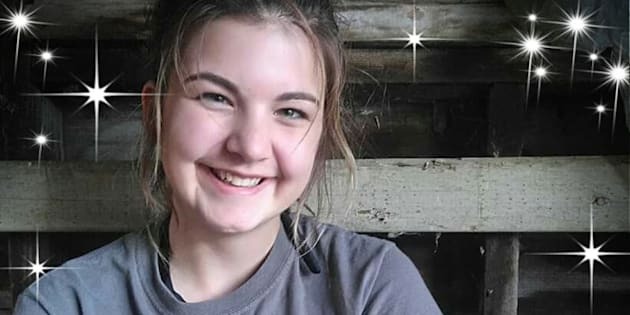 I hope they get pissed at me and tell me to mind my own business and then I can say I wish someone would have minded my 16-year-old little girl's business the day she was killed," LaRose wrote. Put your phone in the backseat, LaRose pleaded, and if it rings, pull over or wait until you get to your destination. For those on the other end, just leave a message, she said. People will call you back. Kailynn Bursic-Panchuk died on Aug. 22, the day after her 17th birthday. "I can't call Kailynn and she can't call me back. No more hugs, I love yous, kisses. No more birthdays, Christmases. No grad, no wedding, no grandbabies," LaRose wrote. "I have lost my world because of a f**king phone." A survey released in December revealed that most Canadians believe texting and driving is getting worse, despite police crackdowns and public education. In the survey conducted by the Canadian Automobile Association (CAA), 96 per cent of respondents said drivers who text and drive are a threat to their safety on the road, and 83 per cent said they believe texting while driving is a bigger problem now than it was three years ago. Drivers are as much as 23 times more likely to get into a collision when they text and drive, Jeff Walker, CAA's chief strategy officer, said in a news release. Kailynn Bursic-Panchuk is remembered in an obit as selfless . Bursic-Panchuk grew up in Regina and lived on a farm outside Tyvan, Sask., according to her obituary. She was a selfless, straight-A student, involved in choir and drama, LaRose told HuffPost Canada in an online interview. She had the world in the palm of her hand, but "one lapse of judgment changed all that," LaRose said. "If getting her story out makes one person think and put their phone in the back seat — not the console or passenger seat, but completely out of any line of vision — and that one person is saved and their family doesn't have to suffer like us, then my daughter has done another selfless act." The Humboldt Broncos bus crash prompted Bursic-Panchuk to become an organ donor, LaRose shared in a previous Facebook post. Bursic-Panchuk's liver and kidney were donated to three organ recipients. "Her selflessness amazes me at such a young age. She was wise beyond her years. Kailynn, my darling, you have made me the proudest mommy ever. I will always love you with all my heart. Many many people thank you," LaRose wrote. CORRECTION: A previous version of this article incorrectly stated that Kailynn Bursic-Panchuk lived in Weyburn, Sask. In fact, she went to high school in Weyburn but lived on a farm outside Tyvan.